Sean Szymkowski August 1, 2017 Comment Now! Each year, Ford pulls a crew together to build an aircraft-inspired vehicle for the Experimental Aircraft Association AirVenture aircraft show in Oshkosh, Wisconsin. The vehicles are auctioned off at the show’s Gathering of Eagles event to help raise funds for training of the next generation of pilots. 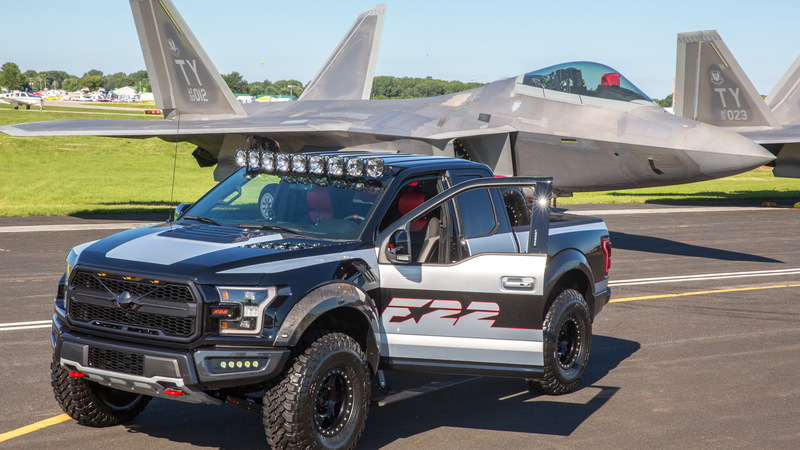 Typically, the vehicles auctioned off are Mustangs but this year an F-150 Raptor, with a design inspired by the F-22 Raptor fighter jet, was selected. 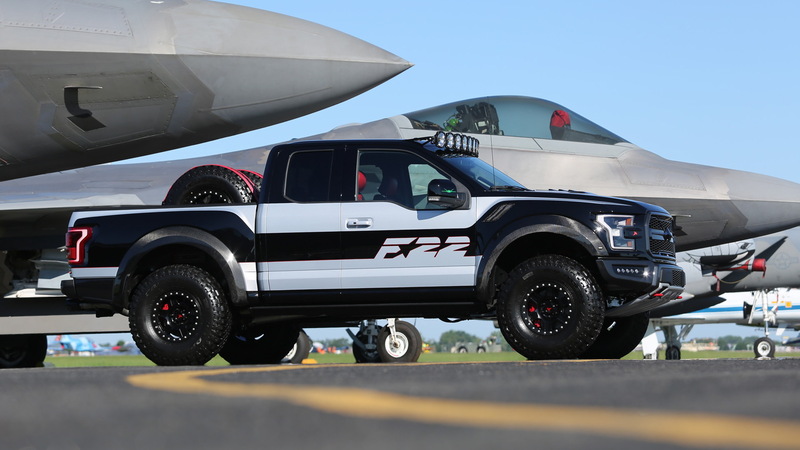 And at the auction, which took place Friday at Oshkosh’s Wittman Regional Airport, the one-off Raptor was sold for $300,000. All proceeds from the sale go toward the EAA AirVenture’s Young Eagles pilot training program and add to the more than $3 million Ford has raised since 2008. The buyer was Gary Ackerman of Gaudin Ford in Las Vegas, Nevada. 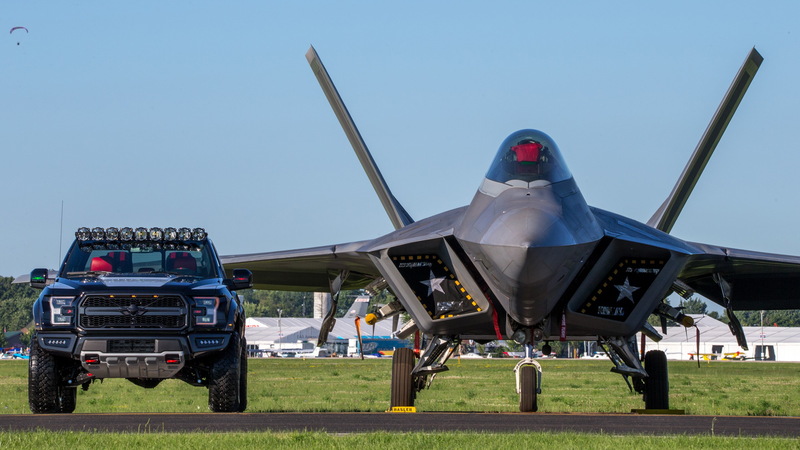 The vehicle has found the perfect home considering that Ackerman serves as Honorary Commander/Ambassador for the United States Airforce’s F-22 Squadron at Nellis Airforce Base in Nevada. 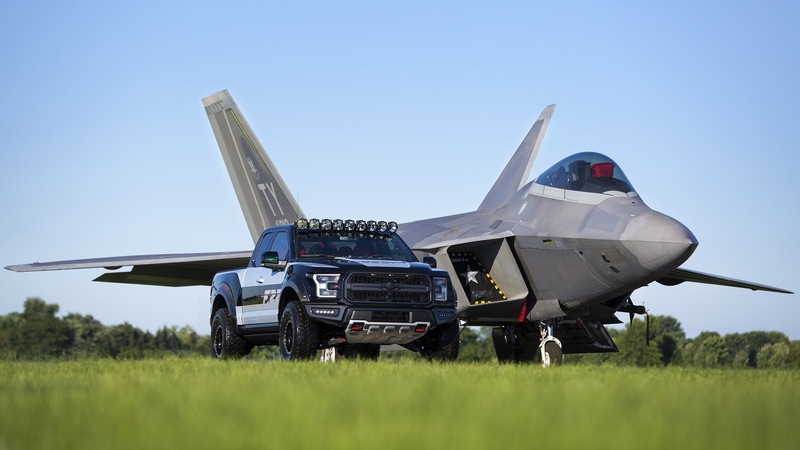 Ford designer Melvin Betancourt took the lead on crafting the special F-150 Raptor. Fighter jet colors, roof-mounted lights, special wheels, and unique graphics throughout the exterior proudly proclaim its aviation motif. Highlights include the DeBerti carbon fiber fender flares, hood and fender vents, plus a titanium finish for the custom grille incorporating an F-22 design, an Amp Research set of powered side steps; a LineX bedliner; and a cat-back Borla exhaust system with carbon fiber tips. It's not all about the looks, though. 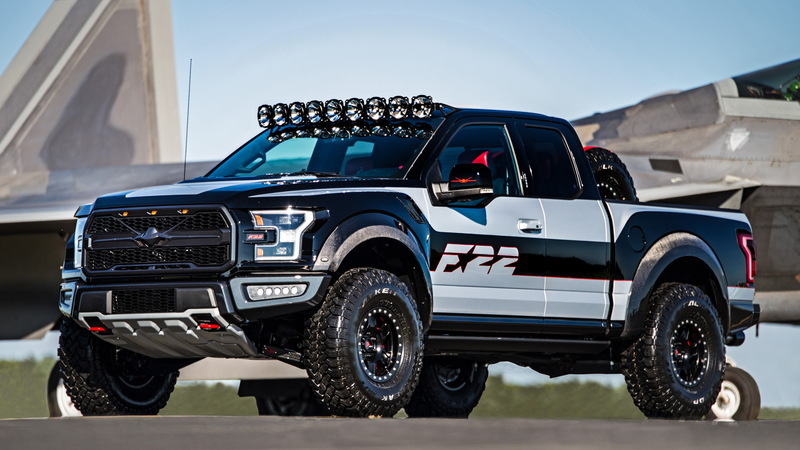 The Ford Performance division increased output from the truck’s 3.5-liter twin-turbocharged V-6 to a V-8-worthy 545 horsepower and 660 pound-feet of torque—a healthy jump on the standard 450 hp and 510 lb-ft. The increase was made possible by dialing up the boost and adding a beefed-up intercooler to help tame the charge air. The suspension was also looked at, with a set of Addictive Desert Design suspension up front and Deaver rear springs added to provide smooth, progressive suspension movement. There's also the Fox bypass series shocks with adjustable compression and rebound valving to enable customized damping for on- and off-road use. The truck was also fitted with Innov8 Racing custom forged beadlock wheels with Falcon Wildpeak tires, plus Alcon 6-piston brake calipers at each hub.